When you want the best optometrist Toronto, come to the Yonge St. Clair Eye Centre. Our optometrists provide years of experience, research, and training in optometry. At Yonge St. Clair Eye Centre, we provide state of the art equipment when you need an eye examination. Dr. Bernard Fresco received his Master’s degree in physiological optics in the area of spatial and temporal neural processing at the University of Houston. He completed his residency at the State University of New York (SUNY), where he was appointed Assistant Professor in charge of contact lens clinics. His initial optometric training was in South Africa, at the Witwatersrand Institute for Advanced Technology. He has lectured internationally in the areas of neural processing, ocular pathology, vision development, environmental vision, and contact lenses. Dr. Fresco has been on the faculty of four international universities. He was the Woodruff lecturer at the University of Waterloo. Dr. Fresco has published in peer-reviewed journals with over 20 publications. He has also served as a consultant to multinational companies. Dr. Fresco has invented several devices and holds multiple patents in the area of eye health, glaucoma and other vision related areas. He has been active in research for contact lens materials, glaucoma, lens design, ocular pathology and systemic effects on vision. 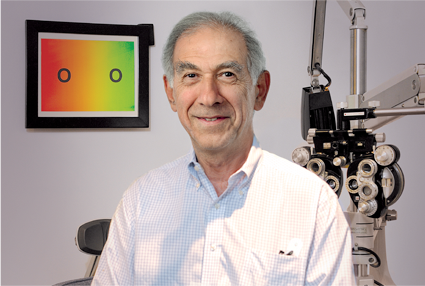 In 2014, Dr. Fresco wrote and published “Eyeknow,” a handbook on eyes and vision. His clinical practice has been at Yonge and St. Clair in Toronto for over 25 years. Dr. Fresco was voted Best Optometrist in Toronto by Toronto Life magazine. 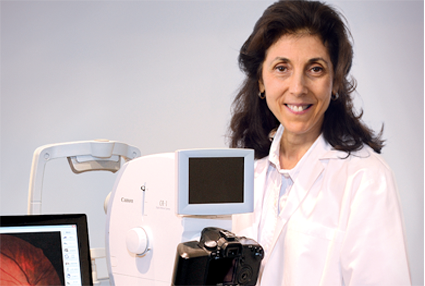 Dr. Fresco is a member of the Optometric Glaucoma Society, and a fellow of the American Academy of Optometry. Dr. Karin Simon was educated at the University of Houston, the London Refraction Hospital in England, and the Witwatersrand Institute for Advanced Technology in South Africa. She was a clinic instructor at the University of Houston. In clinical practice for over 30 years, her experience has been in both optometry and ophthalmology practices internationally. For over 20 years, she has served on various committees for the College of Optometrists in Ontario, including Ethics, Registration, Discipline, Bridging and Fitness to Practice. She has extensive teaching experience in her role as a Quality Assurance Coach in optometry. Dr. Simon has researched in the areas of glaucoma, contact lenses, and ocular pathology. Make an appointment with an optometrist Toronto at the Yonge St. Clair Eye Centre, call (416) 922-2020.